Little Princess LOVES her Alphie! ALPHIE robot, the loveable, learning toy is back and better than ever with lots to say and lots to play! A cheerful, curious personality and friendly voice enliven this treasured ALPHIE pal who encourages children to learn and have fun. 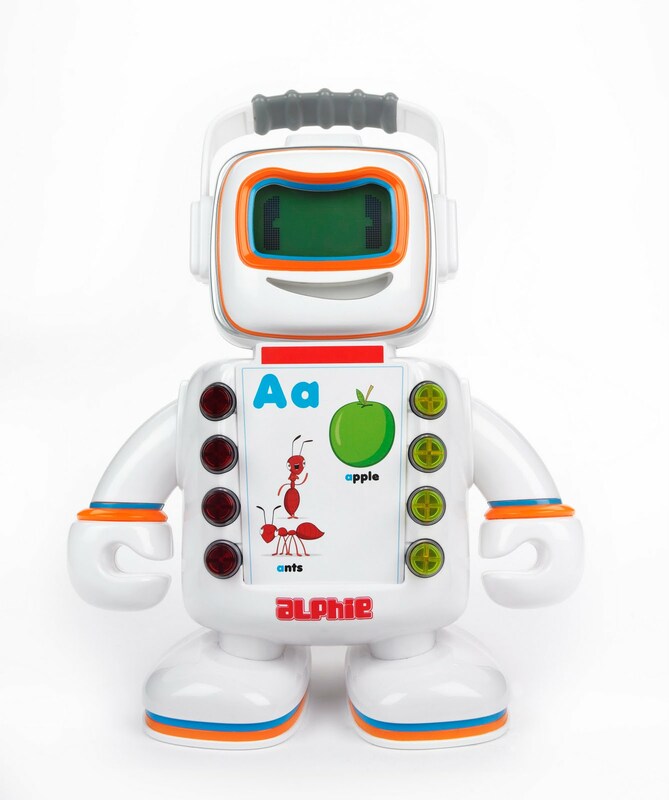 Now more lifelike than ever before, this learning pal boasts an LCD screen to depict facial expressions, a childlike friendly voice and a playful, inquisitive personality making ALPHIE robot not just a learning toy, but a beloved companion. Along with an animated personality that children will adore, this modern ALPHIE pal from PLAYSKOOL features important educational activities that can help develop early learning skills in toddlers. With their playful ALPHIE learning pal leading the way, preschoolers can learn about the alphabet, rhyming, counting, color and shape recognition, matching, animal names, instrument sounds and much more! The ALPHIE learning pal has a sleek new look and convenient carrying handle and comes with thirty double-sided cards containing over 350 fun questions and challenges. Requires three "AA" batteries, included. Available at most major toy retailers nationwide and on HasbroToyShop.com. Engaging alphabet, counting and animal themed booster packs allow children to expand the learning fun with their fascinating ALPHIE pal from PLAYSKOOL. Kids will have a blast playing new activities with their fun loving ALPHIE pal as they discover animal habitats, practice phonics skills and more! The expansion packs also offer additional animations and phrases, keeping kids interested and engaged. Each pack is sold separately and includes over 300 questions and challenges. Available at most major toy retailers nationwide and on HasbroToyShop.com. Tanya Peila and Hasbro are giving away one Alphie! 5. Follow Hasbro on Twitter. I'd like to win this for my son because I think he'd really enjoy the animal questions and the instrument sounds. Thanks for the chance. I loved this toy growing up!! I would SOOOOO love to win ALPHIE for my 3 yr old son!!!! He is doing really great at learning his letters, colors, and shapes so far, but I think that ALPHIE would be a great boost to his learning by adding a fun factor to it!! EXCELLENT giveaway! I'd love to win this for a good friend's daughter. My son is just learning phonics and he would love the robot look of this toy. I would like to win this for my son. His 3rd birthday is coming up and he starts pre school this year and it would be great for him to have this before he starts school! I would love to win, this looks like a great toy, fun and educational! i would love to win this for my son because i had one win i was little and i know he would love it. I would love to win this for my preschooler grandson. I think using ALFIE would make learning the alphabet, numbers, and colors more fun for my grandson. Alphie looks amazing! I want to win so he can teach my daughter her numbers. I would love to win this because it would be perfect for my niece! And I love the Playskool brand..they make such wonderful toys! I would love to win this for my son because he would love it!